Over the course of 12 years, Jason deCaires Taylor's wanderings as a paparazzo, a diving instructor, and a theatrical set designer had left him filling unfulfilled and disconnected from the artistic life he had envisioned for himself during art school - and the oceans he fell in love with during his childhood in Malaysia. So he made a change, buying a small diving center in the Caribbean to support a renewed focus on his art. What he soon discovered was that his two seemingly different passions - art and the ocean - weren't mutually exclusive. 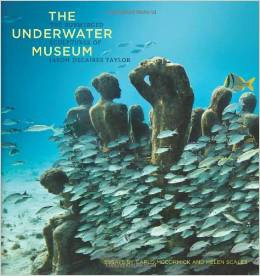 "The intersection of art and the ocean struck me as being excitingly unexplored terrain," deCaires Taylor wrote in the foreword to a new book of his work, Underwater Museum. "I quickly realized that my passion was not for teaching scuba diving but for creating art that would facilitate marine life." ... Much of the ocean floor is too unstable to support a reef, so deCaires Taylor has created artificial reefs - statues placed anywhere from four to nine meters underwater - to encourage ecosystems to take hold and flourish. The statues are almost as diverse as the ecosystems they hope to foster.